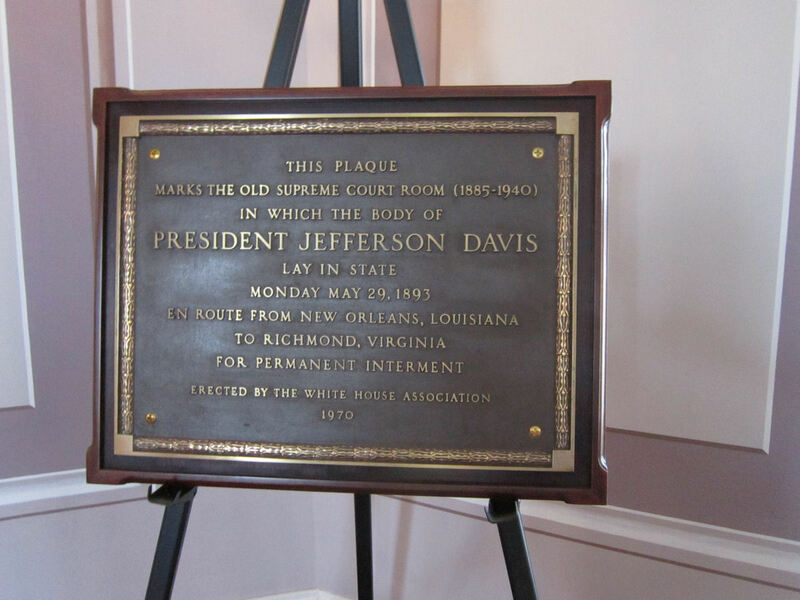 2015 Road Trip Photos #43: Jefferson Davis Rules « Midlife Crisis Crossover! Oh, we know we are in Dixie. Hooray. Hooray? Presidential sites are a common go-to on our road trips. We’ve done Presidential homes, Presidential gravesites, places where Presidential events occurred, statues of Presidential Presidents, paintings of Presidential winners and wannabes, and so on. Our drive through southern Mississippi on Day Five had given us a closer look at the post-term life of a very different leader — Jefferson Davis, the first and last President of the Confederate States of America, who spent his final years writing his memoirs at Beauvoir. Davis would’ve reigned the entirety of his scheduled six-year term if it hadn’t been for that darn Civil War and all those meddlesome Yankee kids. To his credit, he lasted a lot longer in office than William Henry Harrison and six other full-fledged American Presidents did. 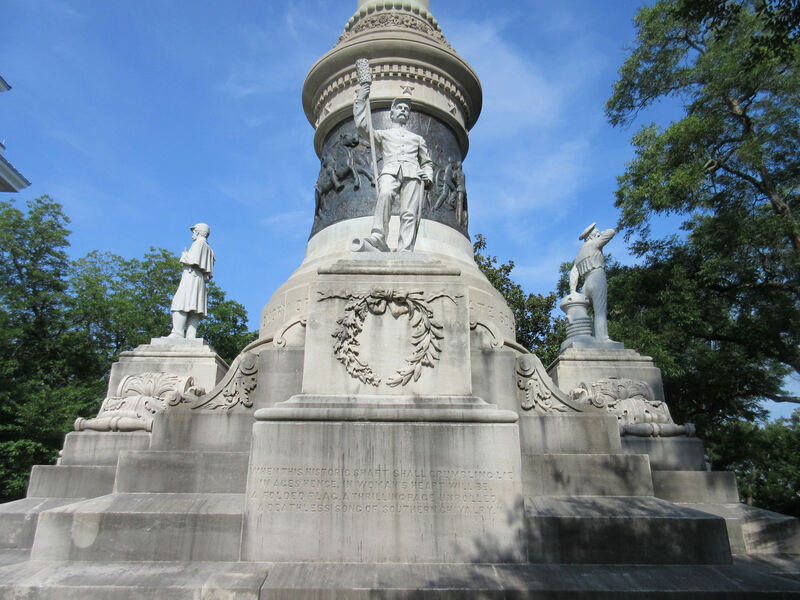 Maybe Davis’ endurance is one of the reasons Montgomery, Alabama, still holds a place in its collective heart for him, as we found on the morning of Day Six. 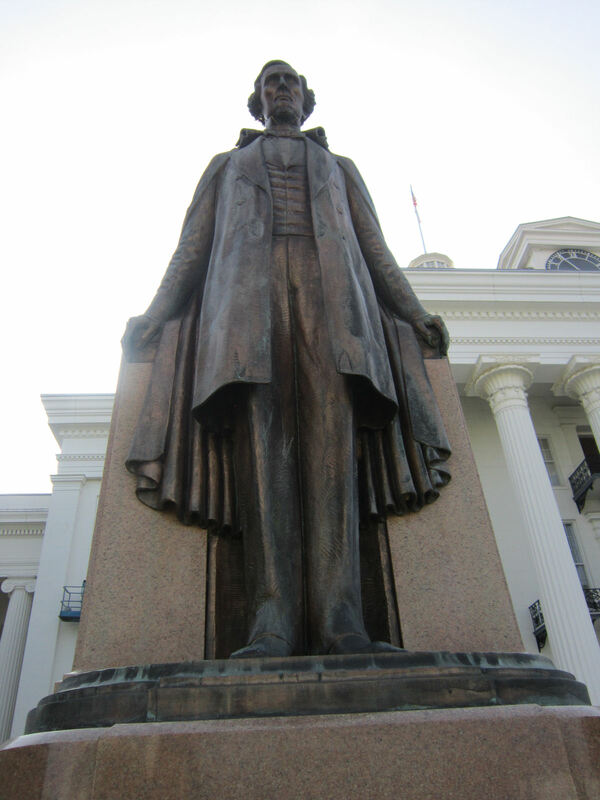 Hence the large statue shown above, which stands tall on the grounds of the Alabama State Capitol. Our long walk around this mostly deserted metropolis had turned up a significant number of great moments in civil rights history, among other various commemorative images and places up and down its streets. But Davis and his legacy occupied far more square footage on the official Capitol grounds than any other personage or movement. 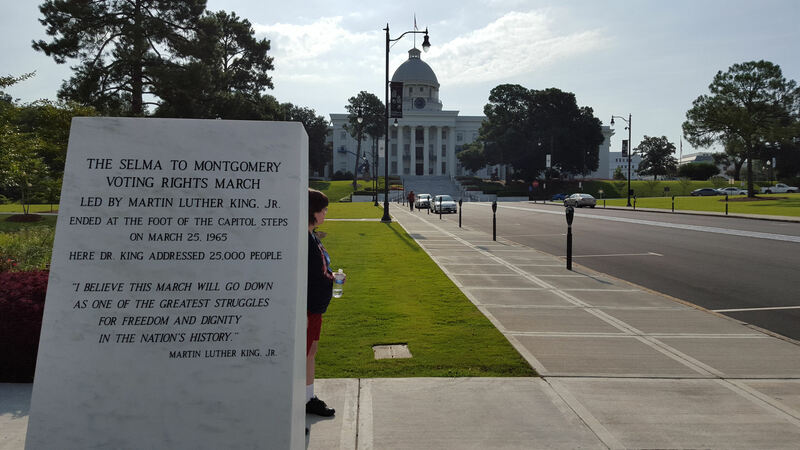 The march from Selma to Montgomery went straight down Dexter Avenue and up to the steps of the Alabama State Capitol. It stopped dead at the steps. It did not touch the steps. There’s a small ground marker where MLK stood and addressed the crowd, a foot or two off official Capitol grounds. Special thanks to the docent who pointed this out to us for exacting clarification. 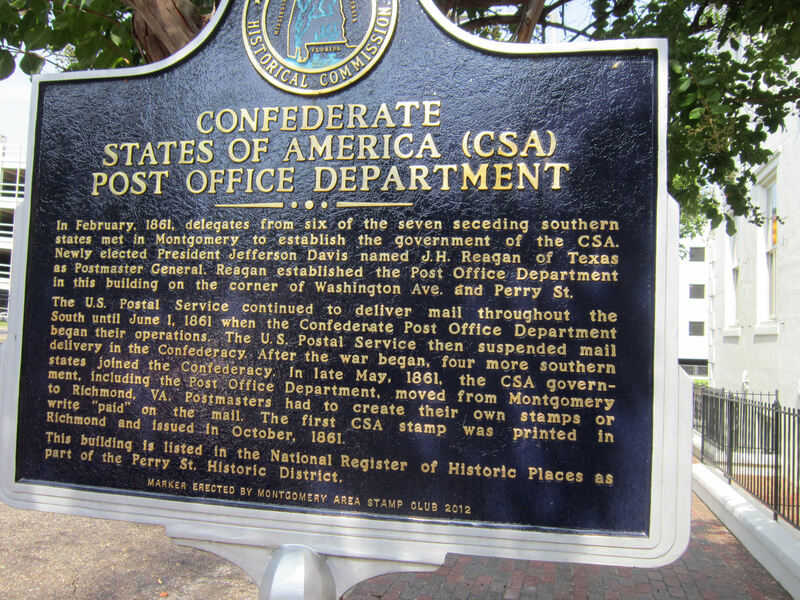 Among other government functions, Davis enabled the Confederacy to take over mail delivery with its own postal service. One thing you’ll notice about all our pics of the Capitol: no Confederate flags. They didn’t have one atop their dome, as evidenced by this passive-aggressive marker describing the day that the basic U.S. flag retook the pole position. Never forget all that martyred cotton and corn. Oh, and shame about that Lincoln guy. 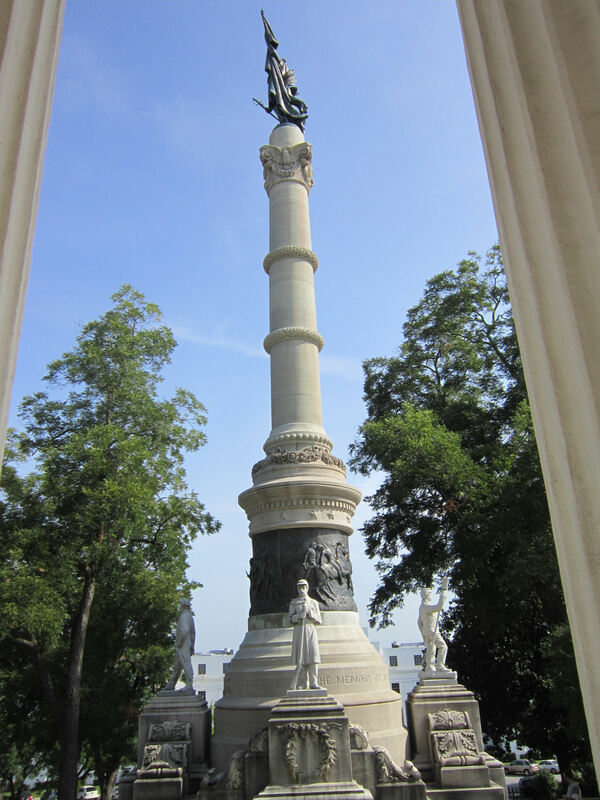 There once was a Confederate flag decorating this memorial to the 122,000 Alabama natives who served in the Confederate Army. In the wake of the tragedy at Emanuel AME in South Carolina, Governor Robert Bentley ordered it yanked three weeks before our visit. 88 feet tall, made with limestone brought in from Bedford, Indiana. Once again our home state rears its head in the oddest places. Fundraising efforts courtesy of the Ladies Memorial Association of Montgomery, who over the course of years collected tens of thousands of dollars to bring this to fruition. 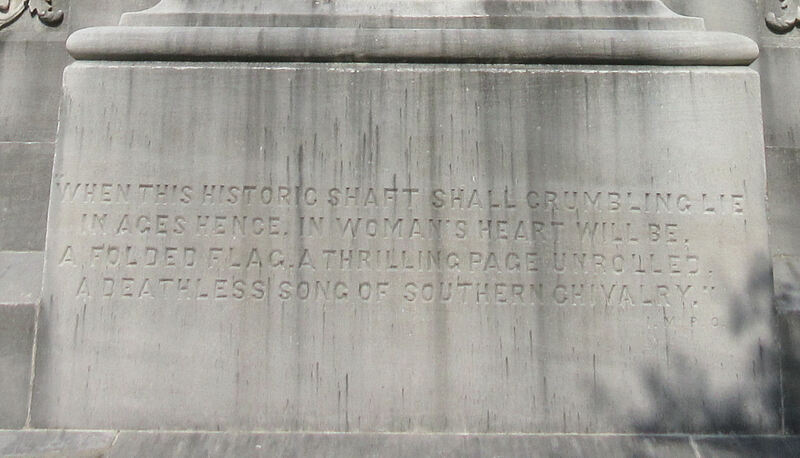 Verse at the statue’s base written by Mrs. I. M. P. Ockenden, Treasurer of the L.M.A. 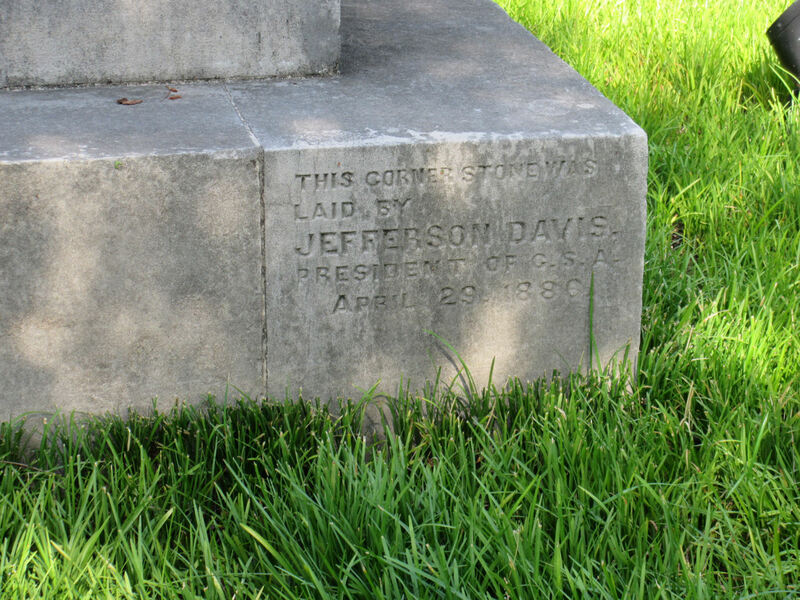 The memorial wasn’t completed and dedicated till 1898, but this cornerstone was laid in 1886 by — you guessed it — former President Davis, who died three years later. As mentioned above, there’s a marker for MLK’s position next to the Capitol when he spoke to the marchers who’d arrived after the long trek from Selma. Actually on the Capitol grounds, there’s a marker where President Davis stood for his inauguration. 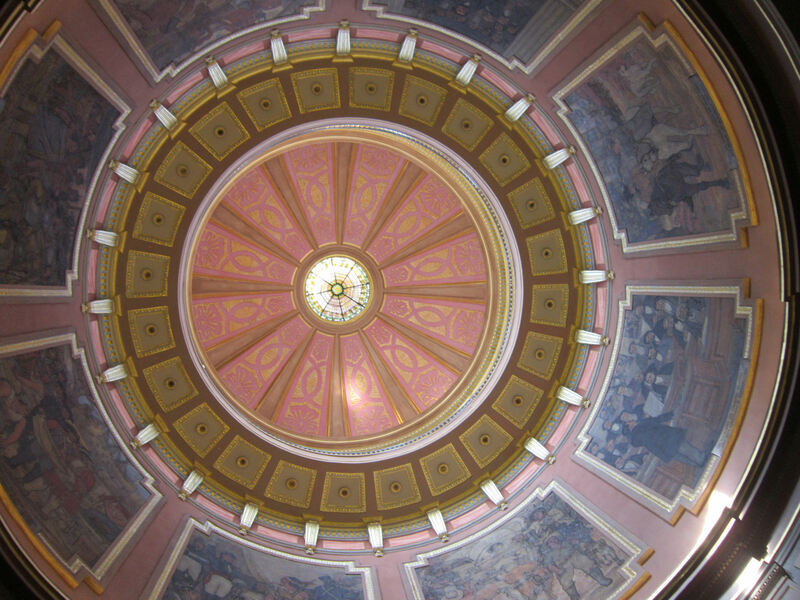 The story continues inside the Capitol itself, with this series of paintings on the rotunda ceiling depicting milestones in Alabama history. Our least worst shot. Dreadful sorry about that. 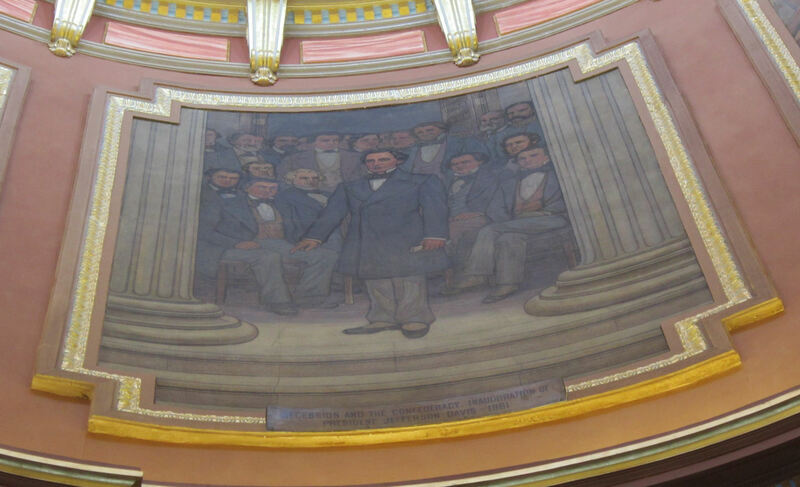 Mural #7 of 8: “Secession and the Confederacy, Inauguration of President Jefferson Davis, 1861”. NEVER FORGET. Once upon a time, Davis’s body lay in state in the Capitol for three months after his passing. Today his remains are in Richmond, which we drove through without stopping on our 2008 road trip. So we’ll have to save that Presidential gravesite visit for another year. John Tyler also rests in Richmond, so I’m sure we can multitask next time we’re out that way. 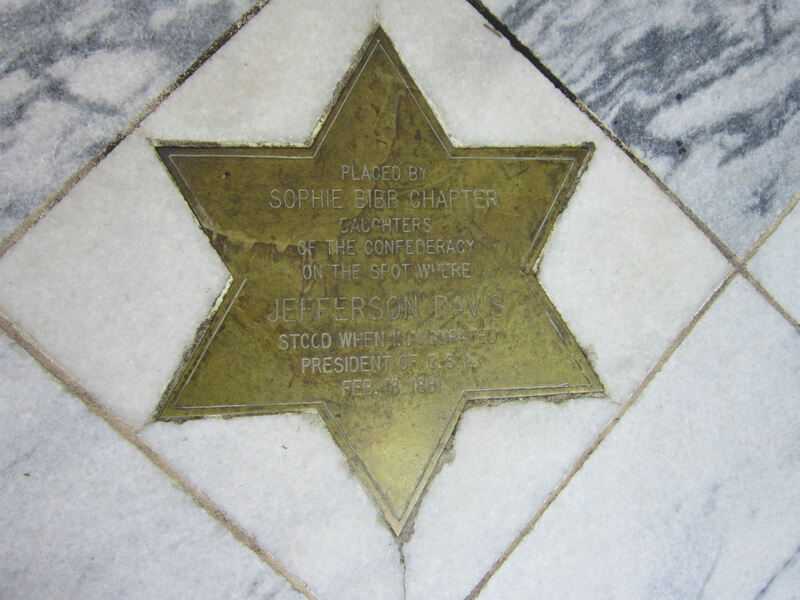 We found exactly one official memento of the Civil Rights movement on Alabama State Capitol grounds. The Goat Hill Museum gift shop on the lowest levels has books about it. I picked up volume 1 of Congressman John Lewis’ graphic-novel memoir March, illustrated by Nate Powell. Strongly recommended. I still need to get volume 2 sometime. By the time we’d seen all we needed to see of Montgomery, we had half an hour left before checkout time at the hotel. We hurried back, drank several gallons of water, changed clothes after having ruined ours, and hit the road. Other than stops for gas, lunch and snacks, these would be our final hours in Alabama for the year. Someday we hope to return to this wide, varied, storied state and visit the places we missed — Selma, Huntsville, and more of Mobile beyond the USS Alabama. But we think we saw all we needed to see of Montgomery. 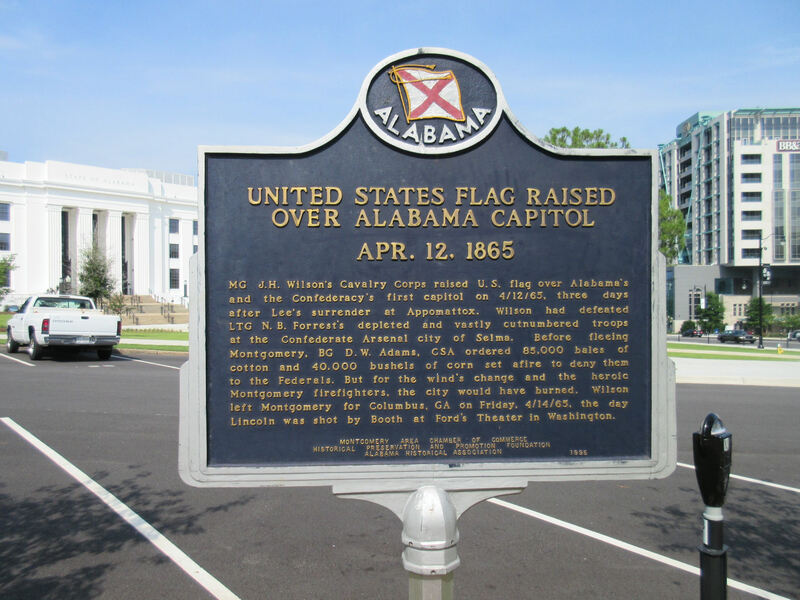 If you’re planning your own Alabama road trip in the future, there’s a group who, just last month, announced plans to install a super-size Confederate flag across from Alabama State University. So you might keep your eyes peeled for that.